Among rendering die-hards, the name “Maxwell” has long been synonymous with jaw-dropping realism. 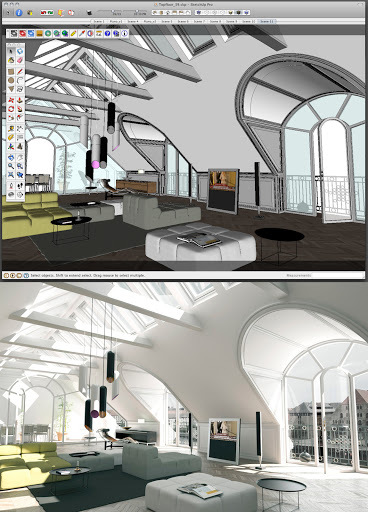 Maxwell Render’s makers have offered a SketchUp-to-Maxwell solution for a few years, but it required modelers to have access to Maxwell Render Suite—the full, standalone version. For SketchUppers on a budget (or who only need to make the occasional rendering), this wasn’t an ideal arrangement. A delicious Maxwell render by Rune Skjøldberg. Cross-platform. It works on both Windows and Mac systems. For both free and Pro. It works on both SketchUp and SketchUp Pro. Two entry points. There are free and licensed versions available. As you can see in this straightforward feature matrix, the free version allows you to render in Draft mode and limits your resulting image to a resolution of 800 pixels. The Licensed version adds Production mode (faster rendering of complex lighting) and increases your maximum output resolution to 1920 pixels. At only $95/75€, the paid version is a bit of a bargain. 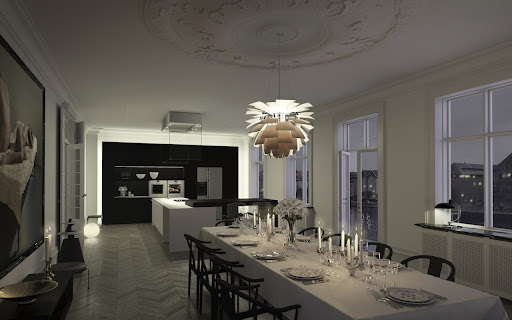 Another render by Rune Skjøldberg showcasing multiple light sources. If you’re looking for all the bells and whistles and extra pixels that Render Suite offers, the “bridge” plugin for sending your SketchUp model to R.S is still available. So really, SketchUp modelers who want Maxwell’s delicious, unbiased results have three options. And they’re all good ones. SketchUp wants to post a Maxwell render on its G+ page! This is amazing software, and the results add the finishing touch to any project. I installed the free version. I reinstalled Silverlight 4. Now Maxwell works! I installed free version in Sketchup Pro 7.1 as per Maxwell's install including Silverlight 4.0, but when opening Pro 7.1 Error message says cannot load Maxell. Anyone have a answer? Only I am on this computer on Windows Xp. I think I've done everything correctly in order to install the Maxwell Suite, but yet it doesn't show in the menu toolbar. I've pasted the "suite" folder into the Skp plugin folder, as we are told to do. I've also got Sivlerlight 4.0 installed. Please, tell me what have I done wrong. Any assistance in instructions on how to get windows in my model to be transparent and not black? I want to see inside the space. Tried the freeware version of MAXWELL on a a high end system (i7 3.2GHz, 6GB RAM, 1GB video) and the rendition of scenes left a lot to be desired in most scenes. The walls showed many concentric lines. I don't think the freeware version is good enough to evaluate the product and as such I (personal opinion) would be hesitant to buy the commercial version just to see if it works out. I'm a beginner with this app and have good luck inside the software but terrible luck getting it out into a usable image file for working in other programs like photoshop. Also can't get silverlight to show up in the plug-ins folder. And nowhere to go to find out what i've done wrong. Advice? Am a complete beginner with the Maxwell render I have been looking for free tutorials but cannot find them. Is there anybody who can help me with video or even pdf tutorials on how to use it? Please!